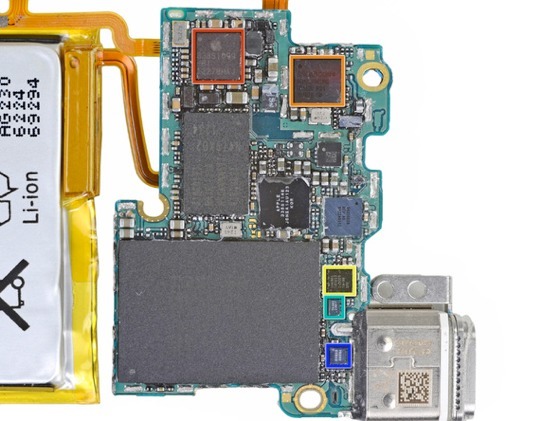 The teardown experts at iFixit have taken apart the new Seventh-Generation iPod Nano, noting how much work Apple's engineers put into making the device as thin as possible. The teardown notes that the battery has a rating of 0.8Wh, more than twice the rating of the prior generation Nano. The battery, Lightning connector and volume controls are all soldered directly to the logic board. The button cable and headphone jack are attached as well. The site does note that the LCD and digitizer glass are not fused together, allowing replacement of either component individually. iFixit found components from Apple, Broadcom (Bluetooth + FM Radio), NXP Semiconductors, Toshiba (NAND flash), and Texas Instruments (touchscreen controller) inside the Nano. Overall, iFixit found the new iPod nano to be fairly difficult to repair as many components are soldered directly to the logic board. The battery appears to be particularly difficult to replace. The revelation is not a surprise, as Apple does not intend its mobile products to be user-serviceable and the company's efforts to push the limits of design and size reduction have led it to sacrifice accessibility. 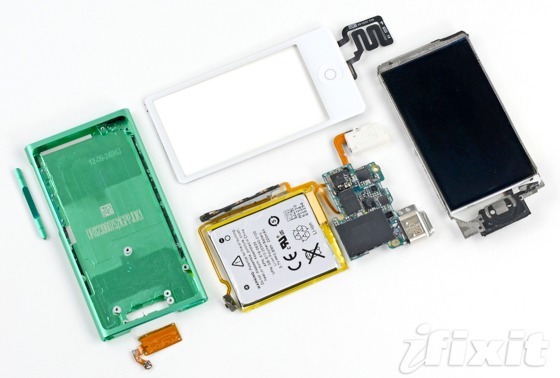 iFixit has also taken apart the Fifth-Generation iPod Touch, as well as the iPhone 5. Every time Apple updates the nano, I get the feeling that they don't know where they want to go with it. At first it was a smaller iPod classic, resulting in the 5th nano, which was the best of the product we've seen so far IMO. Then it became a bigger iPod shuffle, and many of the features in the 5th gen were removed, but people became excited about the possibility of smart watches. Now it's a smaller iPod touch with none of the things that make the touch great(App Store, camera, web browsing, wifi)? It just seems that Apple is keeping the nano around simply for the legacy of it. It also seems that those who just want a music player that's light and pocket/armband friendly are still best served by the 5th generation Nano. In ten years when the collective components are the size of a postage stamp will anyone still care if it's user-servicable? The iPod Nano and the retina MacBook Pro can be repaired and recycled by Apple. iFixit is throwing tantrums because they can't fix them? iFixit needs to get over itself. I'm just sad they took away the clip on the back. The 6th Gen Nano will remain the ultimate Gym nano for a while it seems. iFixIt is stuck in the 1980's and believe that solder is bad, nothing should be amalgamated into one component, glue is bad, thin is bad, Apple is bad . . . They would like us to stop progress so that they can eek out a business fixing things that are superseded by newer technology. This shop should be relegated to the trash heap of history.